SERIES FINALE – Rebecca (Rachel Bloom) makes a life-changing decision about her future. Scott Michael Foster, Vincent Rodriguez III, Skylar Astin, Donna Lynne Champlin, Pete Gardner, Vella Lovell and Gabrielle Ruiz also star. Aline Brosh McKenna and Rachel Bloom wrote the episode, directed by Aline Brosh McKenna (#417). Original airdate 4/5/2019. UPDATE: We now have some photos from the final episode which will hopefully reveal a little bit. Check them out below. 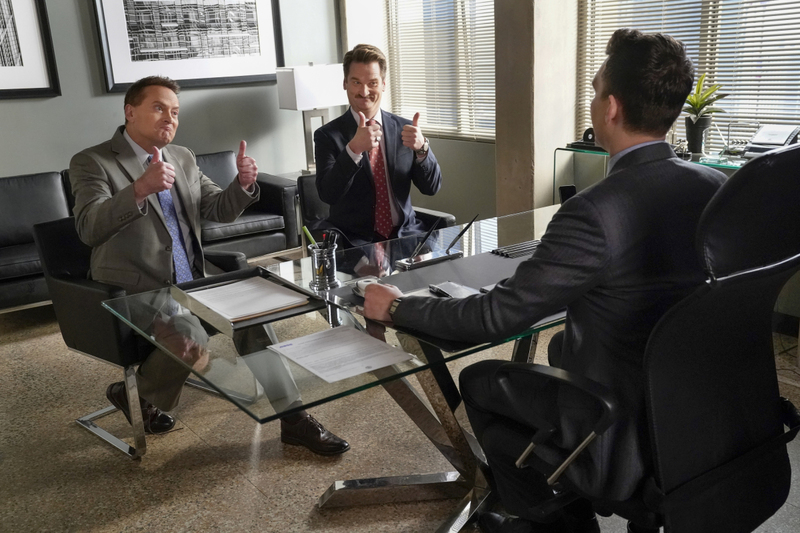 Crazy Ex-Girlfriend -- "I'm In Love" -- Image Number: CEG417a_0102.jpg -- Pictured (L-R): Michael Hitchcock as Bert, Pete Gardner as Darryl and Scott Michael Foster as Nathaniel -- Photo: Greg Gayne/The CW -- ÃÂ© 2019 The CW Network, LLC. All rights reserved.